Der Waffenträger auf Pz. IV ist ein deutscher Jagdpanzer der Stufe 9. Dieser Jagdpanzer wurde im Februar 1944 auf Basis des Panzer Pz.Kpfw. IV entwickelt. Das Projekt wurde zugunsten eines ähnlichen Fahrzeugs auf Basis des Krupp Waffenträgers 12,8 cm PaK 44 tschechischer Herkunft aufgegeben. Nur auf Blaupausen. The Waffenträger auf Pz. IV is a very similar machine to the Rhm.-Borsig Waffenträger. It has excellent camouflage, guns, and a turret, while having absolutely no armor. 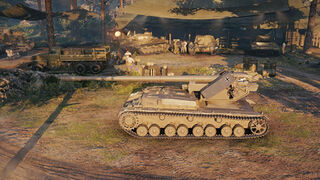 It also has much better acceleration than the Rhm.-Borsig, allowing it to get into position faster. 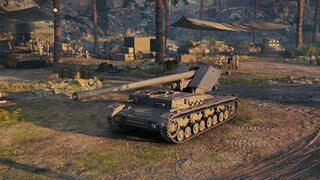 Its two top guns are upgraded versions of the Rhm.-Borsig's guns, with even more penetration and damage, as well as better accuracy. As on the Rhm.-Borsig, the 128 mm gun has excellent penetration and accuracy, as well as good damage, while the 15 cm gun has exceptionally high damage at the cost of penetration, accuracy, and rate of fire. Der Waffenträger auf Pz. IV führt zum Grille 15. The Waffenträger auf Pz. IV can be good training for the tier 10 Grille 15, as this tank has a similar rear-mounted turret. This fact means that both tank destroyers severely lack gun depression. 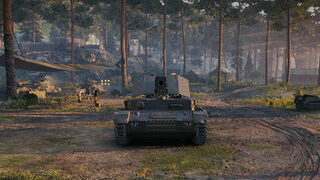 Many players will drive the Waffentrager auf Pz. IV in reverse to allow for minimal exposure and full use of its 5 degrees of workable gun depression. The Waffenträger auf Pz. IV vehicle was developed between the end of 1943 and the beginning of 1944. 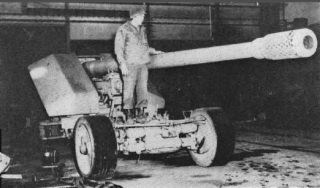 There were two variants planned, one with a 149mm sFH 18 howitzer and the second with a 128mm AT gun Kanone 81. The design was actually scrapped, because in early 1944, the developers started considering putting the guns on even lighter chassis (in this case modified 38t or even 38d) – and Panzer IV didn’t fit it. Another role was possibly played by the fact that by 1944, Panzer IV was already scheduled out of production. The Waffenträger auf Pz. IV never made it past the drawing boards. Diese Seite wurde zuletzt am 25. Oktober 2016 um 13:53 Uhr geändert.